This malicious .DOC file entitled &quot;Violent terror attack&quot; took advantage of the mass stabbing incident in Kunming, China in early March 2014, as social engineering bait. It exploited Microsoft Office vulnerability CVE-2012-0158 to drop a backdoor, BKDR_GHOST.LRK. This Trojan arrives as attachment to mass-mailed email messages. 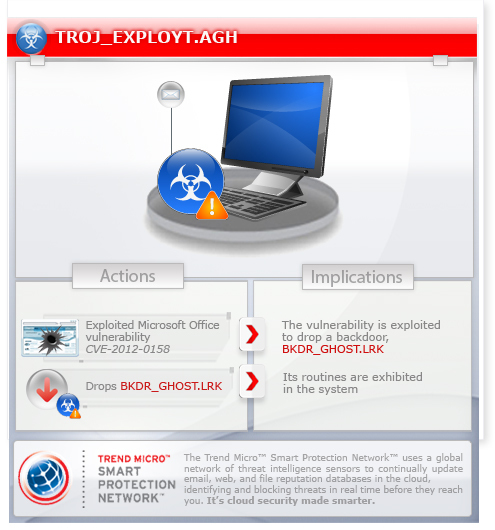 Scan your computer with your Trend Micro product to delete files detected as TROJ_EXPLOYT.AGH If the detected files have already been cleaned, deleted, or quarantined by your Trend Micro product, no further step is required. You may opt to simply delete the quarantined files. Please check this Knowledge Base page for more information.